Sasha and Andy wanted to be a BAD RAP foster home for a dog. Any dog. 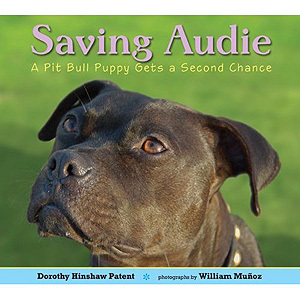 I remember how they spied Audie as I considered his future as a performance dog for myself. I never asked, but suspect they may have adopted him had I not done that myself. But, they wanted to help any BAD RAP dog reach his or her best to find a new home. We asked them to foster Ernie. Ernie survived Michael Vick and remained a happy and thoughtful dog, but Ernie had an annoying habit. He whined. Constantly. The pitch was not far from the decibles required to break glass. Ernie had also never lived with cats. Sasha and Andy have two. Fast forward a few months and a lot of training. Ernie has new confidence, his whining has all but disappeared. And Ernie has two new friends, Henry and Quincy, the resident cats. Sasha and Andy introduced their cats to Ernie slowly and we smiled with each photo update. First was a photo of Ernie sitting politely 10 feet from Henry, then Ernie sitting politely 5 feet from Henry, and one day, Ernie lounging on floor with Henry. He soon won over Quincy too. Ernie’s whine was nearly gone, his obedience stellar, and others started commenting that they wanted their dog to walk on leash just like Ernie, so we decided it was time to help Ernie find his new home. We discovered though, he already had. 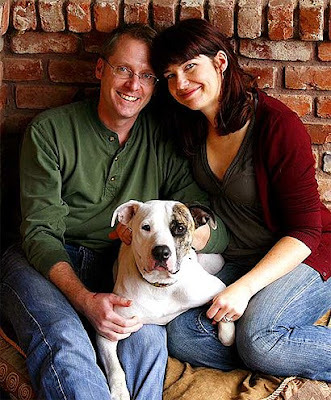 Just the other day, Sasha and Andy requested the opportunity to be his adopters. How lucky can a dog get. 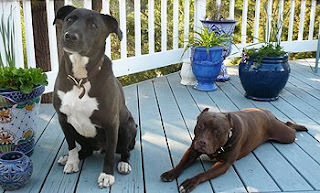 Ernie survived Michael Vick, he survived a long, lonely shelter existence, and he landed a home with a warm, smart couple, two cat pals and his best dog partner, Hana. We’ll be signing final adoption papers soon. Now that’s a happy ending. 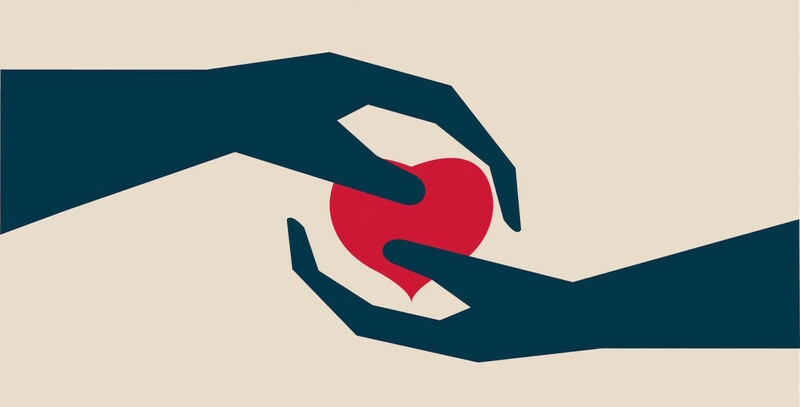 When tragedy strikes, especially in our families, it's natural to look for an immediate explanation and the desire to take action is strong. My heart literally aches for Mr Lovejoy and his family, in Eastpointe, MI. Were I suffering a similar loss, I can only imagine my anger and heartbreak would compell me to try to protect others from enduring the same misery. Unfortunately, when undertaken in the midst of strong emotion and without full details, these efforts can be misguided. “There’s no good to come out of these dogs” said Mr. Lovejoy in his grief. With all due respect, my daughter, the children of friends, my great grandmother and thousands of other families in this country disagree. I've spoken before on this blog about the unintended consequences of our words. I'm certain that Mr. Lovejoy is not motivated to tear apart families and break the hearts of children, but his call for the removal of our cherished and loving family companions can result in exactly that. As we learn more about the details that led to this terrible incident, I hope that we can all remain thoughtful in our judgements and careful in our words. In the meantime, parents everywhere remember to hug your little ones as often as possible and savor every moment. I know I will. Anyone who's lived with a special senior will love this story of Sheri Cardo and her girl, Brigitte. I think we could solve half the world's problems if only we slowed down long enough to take in the lessons that old soul dogs like her offer up. Brigitte passed on in January at the ripe old age of 17 and 1/2. We're so happy that SFGate saw fit to print her story so she could have the chance to steal a few more hearts. Bless you Brigitte and Sheri. Since the media is always peeking in on our world (Photo left: Camera man from ESPN zeroes in on Linda Chwistek and Berenice Mora and dogs Audie & Zippy), it's fun when we can get shots of them touching real live pit bulls. Below is a quick snippet of E-60 reporter Tom Farrey taking Jonny Justice through the cones. What do you think? Is he ready to bring a pit bull into his his life? And below, a fun vid of the gang trying to wrangle their dogs for a group shot. One of the biggest requests from the media has been the group shots. Not easy with this wriggly crew of vermin! This is our dog Honky Tonk after he interviewed a reporter from the ESPN Show, E-60. Honks wasn't too sure about the topic of Vick dogs ("But MOM! When are they gonna do a show about cute little deaf dogs like ME?") but he ended up giving the show's producer a two paws up seal of approval after she let him sit on her lap. The show airs tonight at 7pm, and Tim will be online on the E-60 chat tomorrow to answer any questions the public might have about the dogs. Keep your fingers crossed for a decent show and good response from viewers. We're having a BLAZING belly-up keep-those-water-bowls-full heat wave in the SF bay area today. Time for a little Chomsky from local dog trainer Francis Metcalf to cool our moods. Thanks for sending this our way, Francis ... It's uber happy. ... an HSUS rep following policy tried his best to convince the agency holding the seized dogs, the Bakersfield SPCA, that each one should be destroyed. The key to BB's salvation was a bully tuff District Attorney named Bill Woodruff who insisted they have a chance to be evaluated. He wanted this so badly that he decided to go to the media and make a case for the dogs' lives. Talk about sticking your neck out solo-style. Then, he had to find rescue partners with space available. Not an easy task, but he's a resourceful guy. And so - miracle of miracles - the door opened for the dogs and eleven out of thirty nine were saved. I was never able to thank Bill in person for tackling that enormous job - including the bust, mind you (cyber wave to Bill) - or the anon amstaff breeder who paid for the dogs' neuters, or the kennel staff who took care of the dogs and, I'm supposing, secretly cheered when the Lucky Eleven walked out alive. I wish they knew how much they did to inspire us back then. BB went on to live a sweet life as a pampered pet (aka 'Baby BB') and finally died a couple of years ago of natural causes. We've worked with numerous agencies on cruelty cases including fight busts since then and continue to learn from each. One of the most important lessons has been that, typically, one organization does not call the shots. In any given case there can be several voices, incuding heroes like Bill Woodruff or Brian Whistler and Mike Gil (both Vick dog D.A. heroes) on the ground who want to see the victims saved, but who need to know how to get to the right people who can help. In short - despite common misperception - the HSUS has never been in full control of the outcome of bust dogs. But rather, they have the ear of the authorities including and especially the shelters who trust them to know what they're talking about. Which is why it has been so incredibly important that the HSUS voice support for those of us who know the rescue angle. In the spirit of fine tuning our collective ability to say 'Yes' to bust dogs and to bring compassion to the dogs that can't be helped, I'm looking forward to working as part of the effort now officially known as the 'Victims of Cruelty Working Group.' 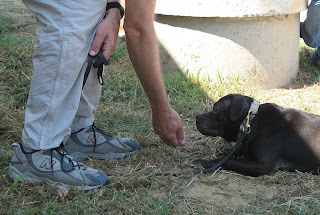 The six participants all have hands-on experience and include reps from: the ASPCA, Animal Farm Foundation, Best Friends, NACA and - Yes, even the HSUS rep, now guided by their new policy to support evaluation and rescue efforts. I have to say that the original HSUS rep who tried to block BB's rescue has since changed his tune and recently shook hands on BR's mission. It took years of dialogue, but I've really grown to like the guy, even tho' early on I wanted to kick him hard in the shins. I hope we get to work together on the next bust in CA because he's a good sort with a thousand good stories and I would love for at least one of them to be about the next BB that he helped save. So yeah - I'm an optimist. After all, pessimism doesn't do justice to the dogs we've been called on to help. Let's be real though. Despite all our best intentions, the hardest part of this work will continue to be space issues in shelters as well as rescues. Busts happen year round (heads up east coasters: Boston Bust) ... and the rescues who routinely squeeze, rearrange and beg up foster care & boarding options know all about the dilemma of taking on too much. But it sure will be nice to have one less obstacle in the way when we're ready and able to help a few good dogs. Keep those home fires burning. Despite the recent focus on bust victims, dog lovers need to continue supporting efforts to help less glamorous but equally deserving victims of urban realities. Foreclosures are still shaking dogs right out of their homes in depressing numbers. Every week, owner surrender forms filled out at Oakland Animal Services cite "Forced to move" or "Foreclosure" as the reason for surrendering beloved pets. It's as heart wrenching as a bust, I tellya. On the right is 14 year old Gemma. We aren't sure why her family had to give up on her, but in a shelter popping full of homeless dogs, she was not going to be able to beat out the younger, healthier dogs vying for the hard to come by kennel space. 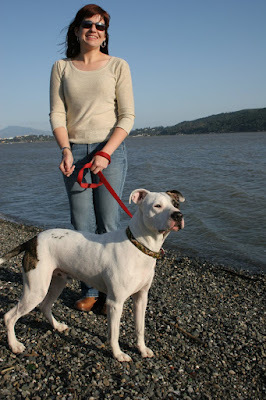 Hats off to BR dog Tyson's adopter Kerry O'Connor (shown left on CGC Day), who made room so she could give this old gal comfort in her sunset days. Kerry gets it -- Talk is cheap to dogs like Gemma and BB. Now, as always, the true fate of these dogs will be in the hands of those who are willing to make room in their hearts as well as their homes. 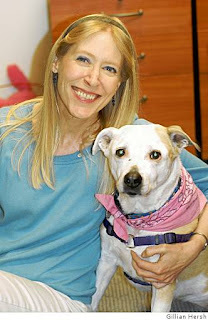 The HSUS has launched their statement from the bust dog summit. This is BAD RAP's statement from the meeting and the direction we will take during our work with the new collaboration. In order to help end the unnecessary deaths of sound American Pit Bull Terriers, the HSUS has officially agreed to change their policy of recommending euthanasia of all pit bulls from confirmed and/or suspected fighting operations and is in favor of the evaluation and rescue of these same dogs. They will update their law enforcement training manual, websites and other materials to reflect this change in policy. The groups involved in the meeting agreed that canine victims of cruelty suffer from the actions of humans and deserve to be treated humanely while in the custody of law enforcement or animal control agencies. The groups will support law enforcement and animal control agencies in their decisions to euthanize dogs when there are no reputable rescue or sanctuary resources available to absorb them. 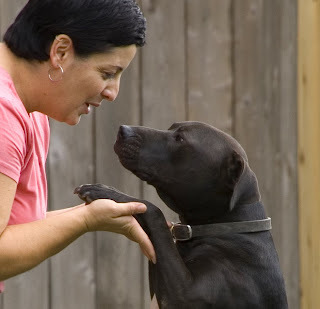 The organizations will form a Working Group to develop future protocols for cooperation in meeting the needs of dogs seized in raids, including how to improve the standard of care of dogs held in custody, how to conduct professional evaluations, and how to council shelters in selecting appropriate homes. Outside of the bust dog meeting - during our time at the HSUS expo this week - we met with one of the founders of the Asilomar Accords who confirmed that pit bulls from cruelty cases are no different from other shelter animals in that they deserve to be counted within the definitions and Guiding Principals of the Accords, which were written to encourage organizations to "find common ground, put aside our differences and work collaboratively to reach the ultimate goal of ending the euthanasia of healthy and treatable companion animals." Welcome to the New World, bust dogs. 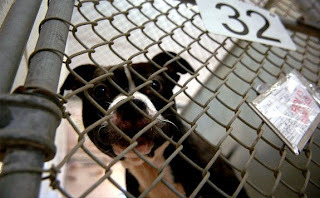 From here on out, you will be counted among the many shelter animals who are also counting on humans to give them a second chance at a real life. The hardest part of going to Vegas for us addicted-to-fresh-air types is moving through the haze of eye-burning, tongue numbing cigarette smoke. The things we do for our dogs. The bust dog summit (named this for now only because it's late and my eyes are still burning and I can't think of a better name) came together as planned on Wednesday of this week. The gathering helped us solidify our partnership with Best Friends, ASPCA and Animal Farm Foundation and - especially - to deepen our collective commitment to dogs caught up in raids and larger cruelty cases. We were happy to bring animal control association NACA in as a new partner, too. And we'll all be looking for a formal policy statement from HSUS that was promised as a result of the meeting. As much as we would love to, it's not appropriate to share details of the meeting in this space, but we DID notice that someone at HSUS has removed a provocative webpage from their Animal Sheltering website, once entitled, "Explaining Your Policy of Not Placing Fighting Dogs Up for Adoption." This now-defunct position statement has driven us crazy for years: "Once dogs have been bred and trained to fight, they may become dangerous at any time in the future, killing or injuring another dog, cat, or even human. The cruel training inflicted upon these animals makes them unpredictable—and unsuitable for placement into new homes." But apparently, it's gone -- and good riddance. More to come. For now, off to snuggle with my dogs, who are wondering where we've been and why we smell like Pall Malls. Above. Uba, way back when he was still an enigma. Tomorrow morning we leave for Vegas to pick apart the topic of fight bust dogs in one of the strangest, most artificial environs known to modern man. Why not? It makes perfect sense. No matter how the meeting comes out, no one can harsh our mellow or kill our happy buzz ... Miss Frida hit the Jackpot and is in her new home this week, and all the bully gods are slam dancing in the heavens to celebrate. Sassy Frida just chuckled at us whenever we worried about her future over these past few months. Don't you just love when they know more than we do? Best line of the week comes from her adopter, Yvette - a committed Ambassadog handler who first named the redhead many moons ago. Every one of the people who looked at her and moved on to a "pretty" dog is an idiot. She is a fabulous dog and we're not giving her back. Yes, ma'am. All respect to you Yvette & Steve for knowing a real dog when you see one. Congrats to everyone, especially Frida. It was a pleasure to write this, and even better - to share. One day soon, we'll have to update everyone on Iggy (left) - our sanctuary case love man who deserves his own tiara.